Want to see how fast and easy you can create a U.S. flag with real dynamics and textures? Follow Alex as he creates a U.S. Flag in under a minute usin.. In final video, video 8, of 3D Flag the Basics we'll learn how to create a looping flag animation. This process is very simple and easy to follow and .. In video 7 of 3D Flag the Basics we'll learn how to work with 3D Cameras. This includes the 3D Flag camera in the setup window, the 3D Flag camera in .. In video 6 of 3D Flag the Basics we'll learn how to change the springiness of your cloth. The springiness determines how much stretch and bend your cl.. In video 5 of 3D Flag the Basics we'll learn how to create a dropping banner. Make your cloth start up high and drop down while you adjust the way to .. In video 4 of 3D Flag the Basics we'll learn how to create a custom material for your cloth. Learn how to add your own images as well create different.. In video 3 of 3D Flag the Basics we'll learn how to create cloth objects other then flags. This includes hanging banners, curtains, backgrounds, and m.. In video 2 of 3D Flag the Basics we'll learn how to create your first flag. We'll start from the very start so there is no need for past experience.Do.. Welcome to 3D Flag the basics. 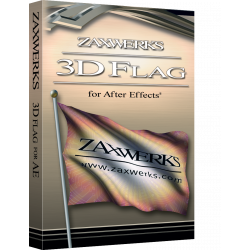 This 8 video course will walk you through everything you need to know to get started with Zaxwerks 3D Flag.Download the..